The sense of smell is more primitive than other senses and is directly linked to that part of the brain which is older, in an evolutionary sagacity, as compared to the rest of the brain. Is it any marvel then, that incense, which has all to do with our sense of smell, dates back to the dawn of history and the burning of incense is one of the oldest practices of mankind. Since Vedic times, fragrance has played a dominant role in Hindu religious rituals and is intimately linked to the Homa or Yagnas. The oblations or offerings consisting of scented and medicinal herbs, resins, barks, leaves, twigs & roots along with foodstuffs and ghee were made to the God of Fire, Agni who, according to mythology, carried them to the celestials. The initiating fumes, with their unique scented properties, purified the environment and had a revitalizing and energizing effect on the individuals. The emanating fumes from the Homas created an aura of tranquillity and helped in experiencing the divine presence, warding of negative influences and evil spirits. However, in modern times, people find it difficult to perform Homas every day and this is where the use of incenses started. In fact, the word “incense” comes from the Latin verb “incendere”, which means “to burn” and the common motif of incense is a sacrificial offering to the celestials. This is where the Navagraha incenses, made with a specific herb sacred to each Graha or planet comes into deed. Lighting “Navagraha Incense ” is considered equivalent to performing Navagraha Homas, as the herbs that will be used in Homa or havan for each “Graha” is, used as an integral ingredient in making this incense too. The herbs used are unique for each Graha and this is how in ancient times, the Homas were carried out with only herbs, as the main ingredient to Homa. 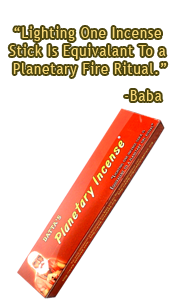 These Navagraha Incense have the power to direct the positive energies towards you and hence influence your fortune. Moreover, it will mitigate the afflictions of different planets on you and will make you stronger to face life head on. The ‘Navagrahas ‘ are worshiped along with the other Supreme Gods and Goddesses of the Hindu pantheon which includes Ganesha, Shiva, Vishnu, Maha Lakshmi, Parvathi, Muruga & Hanuman. ‘Nava‘ which means nine and ‘Graha‘ which means planet, plays an important role in determining the luck and destiny of an individual. Although, positions of these Navagrahas can push an individual up to a high position, a slight alteration of the positioning can also thrust an individual to the depths. As per Vedic astrology, the Navagrahas influence the minds of beings connected to the Earth. Each Graha carries a specific energy and gets connected in a specific way to the individual auras of humans, at the time they intake their first breath. These energy connections remain with the natives as long as they live. In fact, the nine planets are the transmitters of universal and archetypal energy. 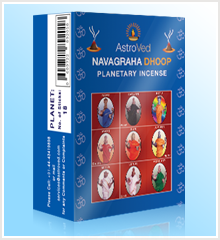 To help you connect with the Navagrahas, AstroVed has come up with Navagraha incenses. These incenses, made with a specific herb sacred to each Graha will create a positive influence in your life bestowing you with the divine energy of the Navagrahas.